Before all the Christmas cheer, I was lucky enough to spend a little time checking out the major city on the Queensland coast. Almost 13 years ago I was on my first plane ride and I wasn’t messing about. I wasn’t gently breaking myself in, I was flying about as far away as I possibly could and endured a five hour stop over in Japan. I landed in Brisbane at sometime early morning to begin my first real adventure abroad and now I’m back. It was an early start on Saturday as I flew out from Melbourne. I’d spent Friday night enjoying some Christmas drinks with my new colleagues and they had been very persuasive and I always seemed to have a fresh drink in front of me whenever I mentioned that I had to get up in the morning. Leaving Melbourne turned out to be quite a surreal experience. Having spent almost 4 months there I’ve started to think of it as home and I was almost a little sad to say goodbye. Upon arrival in Brisbane I was met by Karen, who had baked a mud cake for my birthday the last time I was here. 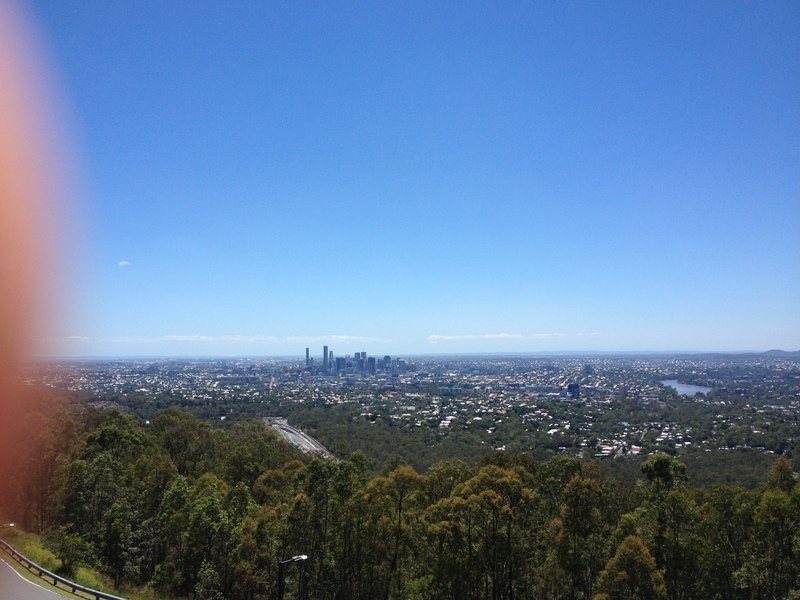 I met her husband Gordon and we got in the car and made our way out to Mount Coot-tha before the day got too hazy for some pretty spectacular views over the city. As we drove through the city I kept expecting to feel the jog of memory and be cast back in time but it just wasn’t happening. We drove to Karen’s niece Liz’s apartment where I was going to be staying while in the city. After a brief tour of Spring Hills, we made it and after dropping my stuff we headed out to China Town for a chat over lunch. After lunch Karen and Gordon had to get on and Liz took me on a bit of a walking tour of the city. We started off at the central station which and Anzac square before heading on to the city hall. Liz informed me that it had recently been recently upgraded so we headed inside. 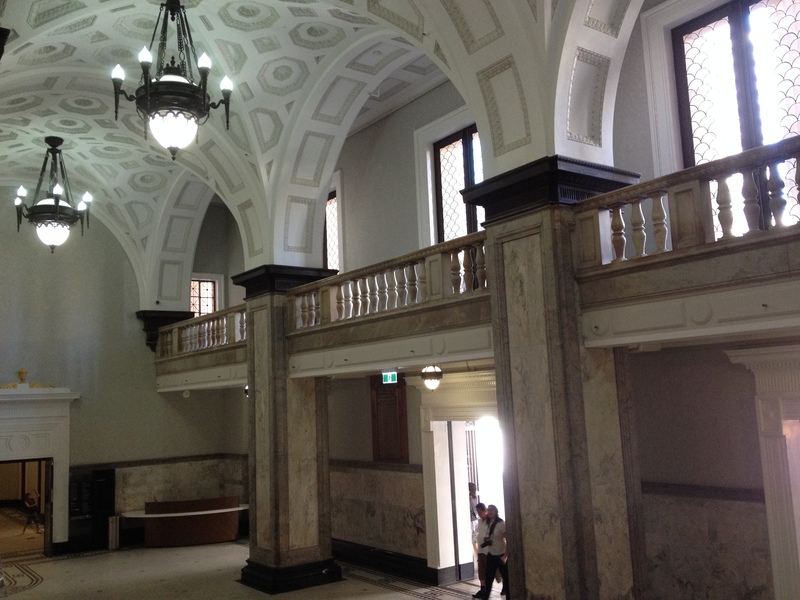 The main entrance was a huge marble atrium, we made our way upstairs and into the main hall where an unexpected light show awaited us on the inside of the ceiling dome. By this point I had it in my mind to get as high up in the building as possible, which turned out to be a pretty futile experiment but would give us a couple of surprises as we once made it on to the roof of the dome and found a couple of grand pianos which Liz stopped to play. 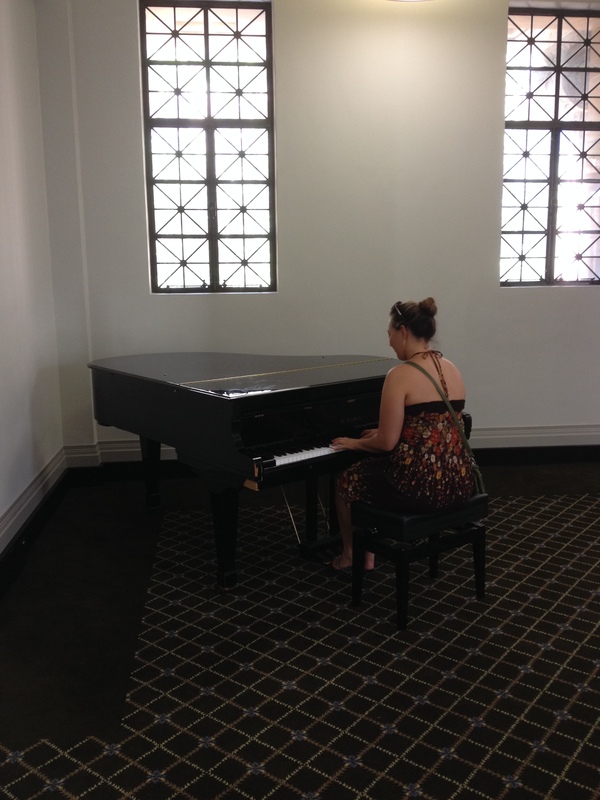 She would later point out that she’d played piano in the city hall and induced a moment of regret. 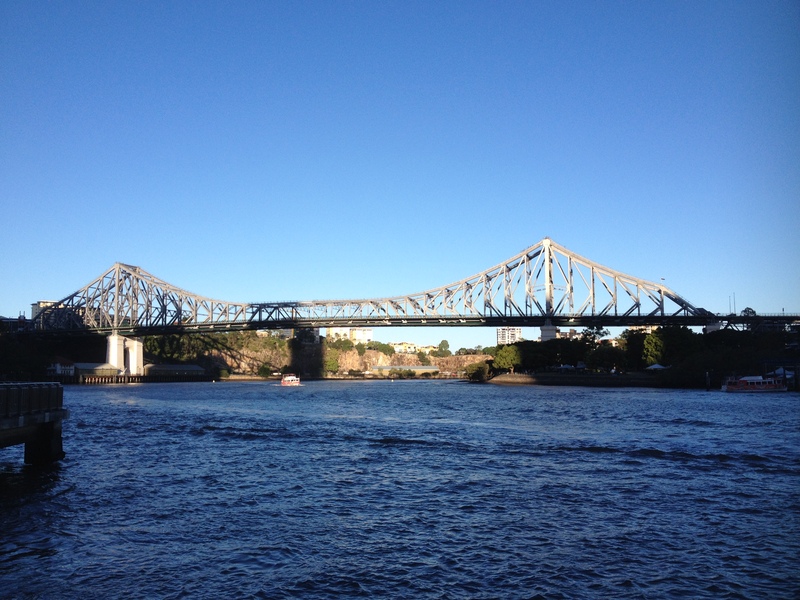 Our tour then continued through the city to South Bank where I once again expected to tap into those past memories. Still nothing. We walked through arches until we got to the artificial beach which I will admit actually looked familiar. However, I’m unsure if this is because I actually remember being here or because I’ve seen photographs of me in the water and have created false memories based on what I’ve seen. I certainly don’t remember it being so busy, or anything else that surrounded it. Maybe it was because at the time I was so young and would have had less interest in the bars, but we stopped for a beer anyway. 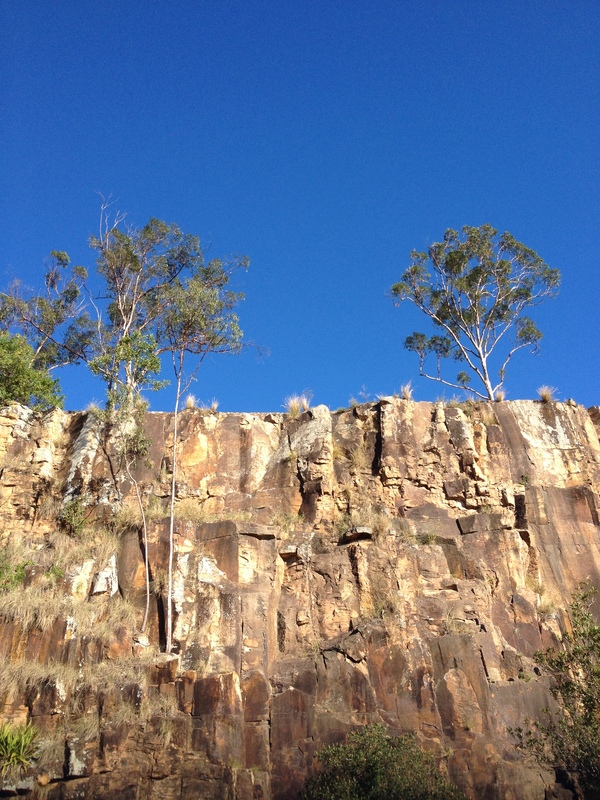 Feeling refreshed we continued on down the Brisbane River to Kangaroo Point cliffs for some pretty cool views back into the city and to witness some very athletic people run up the stairs cut into the rock face. From the top of the cliffs we continued round to Story Bridge and along the opposite bank of the river to Eagle Street Pier where we decided it was probably time for another beer. This time we popped into the Bavarian Beer Cafe for a quick one. After all the walking we’d done, we decided to stop back at the apartment to clean up before dinner. After eating we headed into the Valley so that I could see some of the nightlife available in Brisbane. Obviously there were no potential memory triggers here. Our first stop was Cloud Land which may rank as the most bizzare venue I have ever been in; plants on the outside, a waterfall above the entrance, a bar made of glass baubles. Safe to say I’ll probably remember this one 12 years from now. Next up we hit the Bowery which, if it weren’t for the excessively loud music, was close to perfect. Cocktails, bar-staff who knew their stuff and an excellent sound-track. Due to the inability to hear anyone, we then stepped next door into Laruche for a final round. I actually had strong memories of the time that I spent on the Gold Coast, particularly at Surfer’s Paradies (or maybe Buliegh Heads, apparently not so strong after all.) I remember being in the sea with my Dad, pretty sizable waves around and I could see something out to sea and asked him if it was a shark. He assured me it wasn’t and he was probably right. This time around Liz drove us out to Southport where we would meet up with her sister Kate and her boyfriend Drew and their guard dog Lilly, who would keep most of the much larger dogs at what she considered to be a safe distance. At the beach I would learn what I hope to be valuable lessons, the first about rip tide. 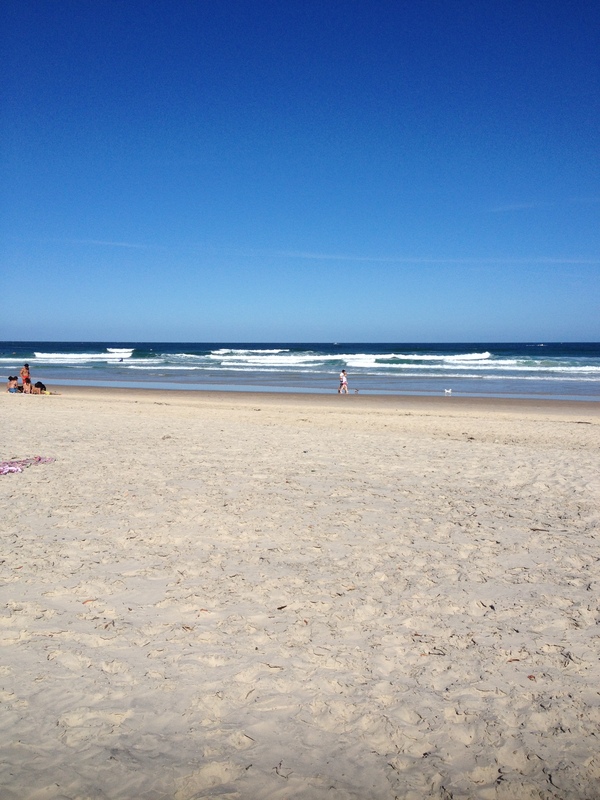 First things first, I have now swam in the sea in AUstralia. The waters up here are significantly warmer than they are in Lorne. The waves were incredibly powerful, regularly knocking me back closer to shore and the rip after would do it’s best to try and drag me down the coast. Back at home I’d consider myself a fairly strong swimmer but out here I’m in much more dangerous waters. I got to see my first jellyfish, one which at the time was actually alive and bobbing about in the waves. Later on there would be several washed up as the tide went out. For the safer jellies, you can just touch them, they do actually feel some what jelly-like, on the top and move them away and they’ll float on. 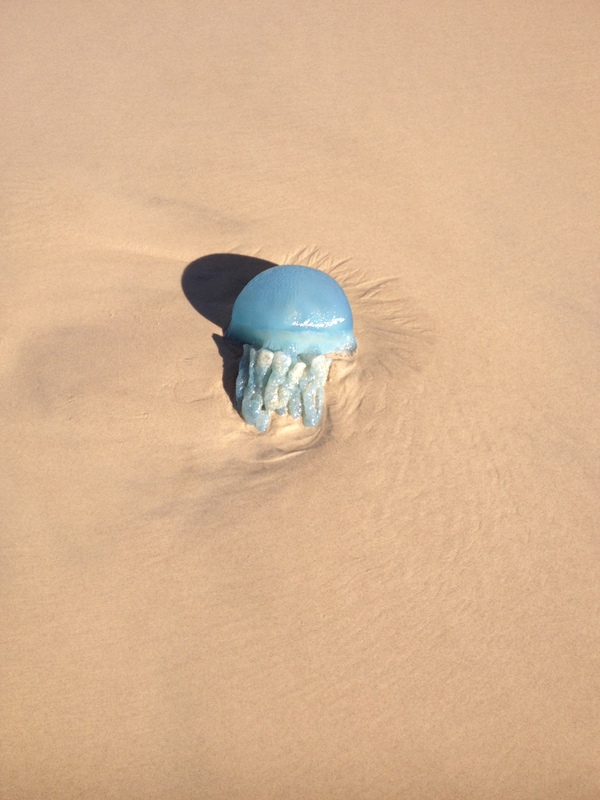 For the not so safe jellies, you hope that there’s warning and you stay on the beach. My next lesson was about the Australian sun. I thought I had been sufficiently careful, plenty of sun cream, a cover up shirt and a hat. I still got burned. A touch on my face and I’m currently sporting a lovely shade of pink across my shoudlers. It just goes to show that you can never be too careful. As the day drew on, Kate and Drew called time and headed home. 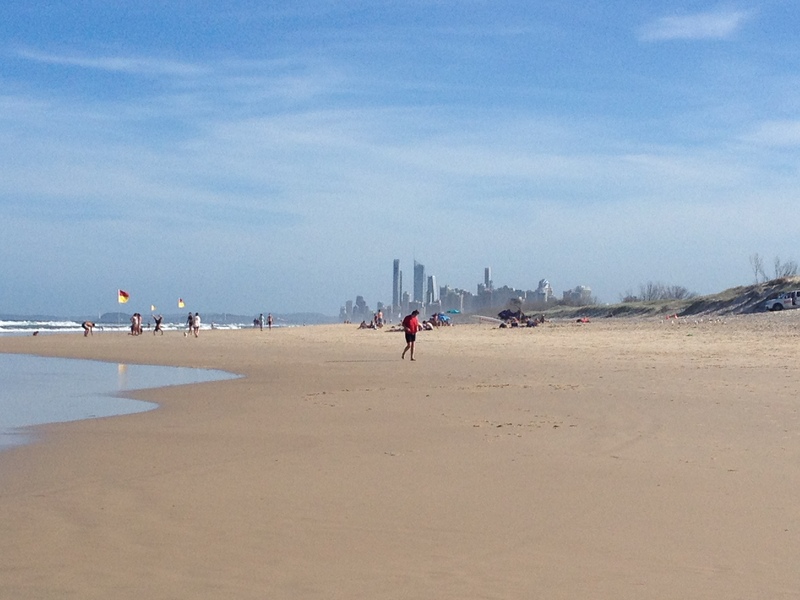 Liz and I drove further down the coast to take a look at Surfers’ Paradise which was is a huge tourist draw and certainly looked the part. Later that evening we would meet up with Kate and Drew in the city again for a pretty smashing Mexican dinner. The following day I had the opportunity to catch brunch and hang out with one of my pals, Emily, from the good ol’ days in Nomads. Brunch was up there as one of the best meals I’ve had out in Australia so far; two poached eggs, tomatoes, mushroom, spianch, home-made baked beans, potato and feta hash brown, and grilled halloumi. It was an avocado short of perfect. 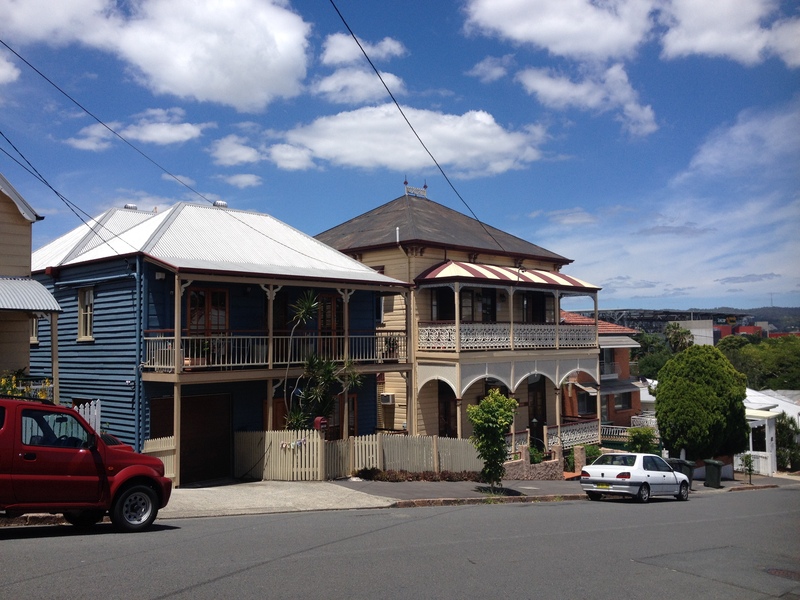 We ate up in Paddington which is perhaps one of the more trendy neighbourhoods that I’ve been to in Brisbane. The little traditional Queenslander homes had been modified to hold cafes and boutiques, it was certainly a cool place to enjoy a coffee. Emily took me on a little tour, and I picked up some Aloe Vera gel to help with my fresh burns as we caught up on our different approaches to travelling in Australia. 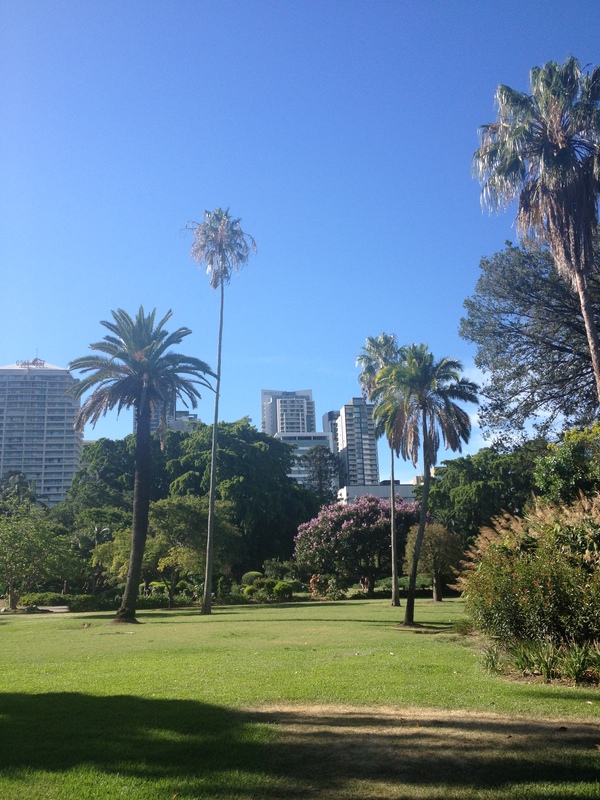 As the afternoon closed in, I decided I needed to see some more of the city and said farewell to Emily and made my way back to South Bank and the Brisbane’s very own botanical gardens. 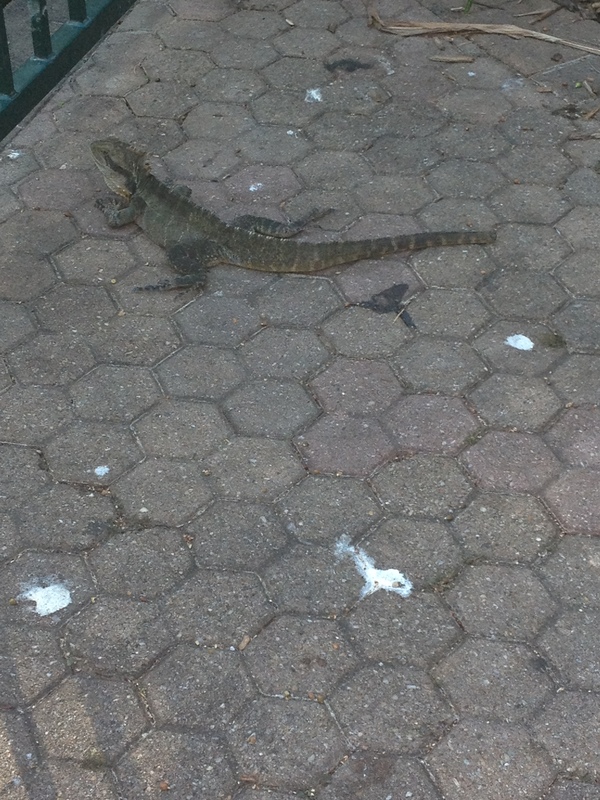 I found that they were very different to those in Melbourne, the plant life was significantly more tropical, the birds out and about were a little different and there were some medium sized lizards catching some sun. I had a pretty good time wandering around before making another, perhaps final, attempt to walk down memory lane. 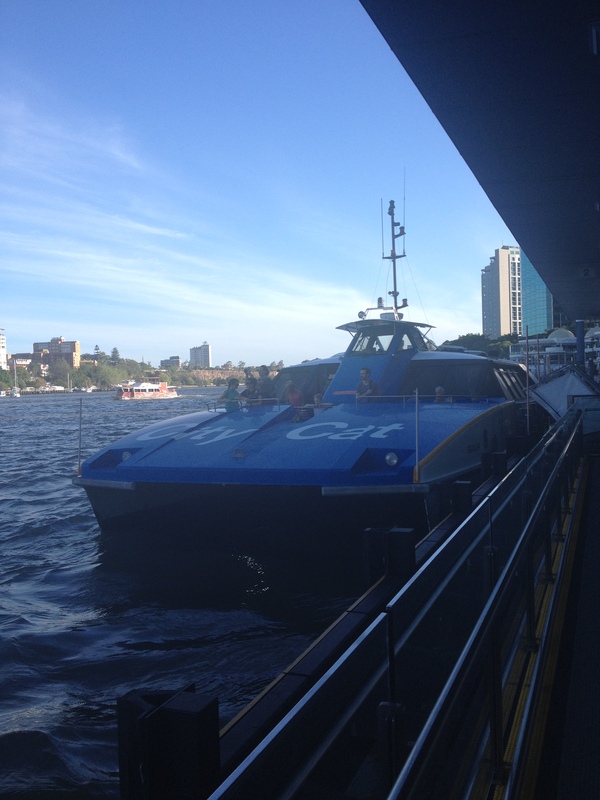 I caught the City Cat; the cities Catamaran river service down to Riverside which is a little further downstream from Eagle Street Pier. I feel like I can recall being on the boat and the river but I have no recollection of where or what direction I went in. Coming back to the present it was interesting to experience Brisbane as an adult. Having spent so long in Melbourne I hadn’t really considered quite how different another Australian city could be. Even stepping off the plane I could feel it. The heat is different here; it’s more humid, the people are different; it isn’t as multicultural and everyone seems even more laid back, the shade of green is different; the plants are more tropical, and it seems to be a lot more suburban; in Melbourne it feels like you could walk around any corner and find a cool bar or cafe whereas outside of the city, Brisbane is very much a residential city. It certainly seems to be a lot more Australian and I can see why Melbourne claims to be the most European city in Australia. 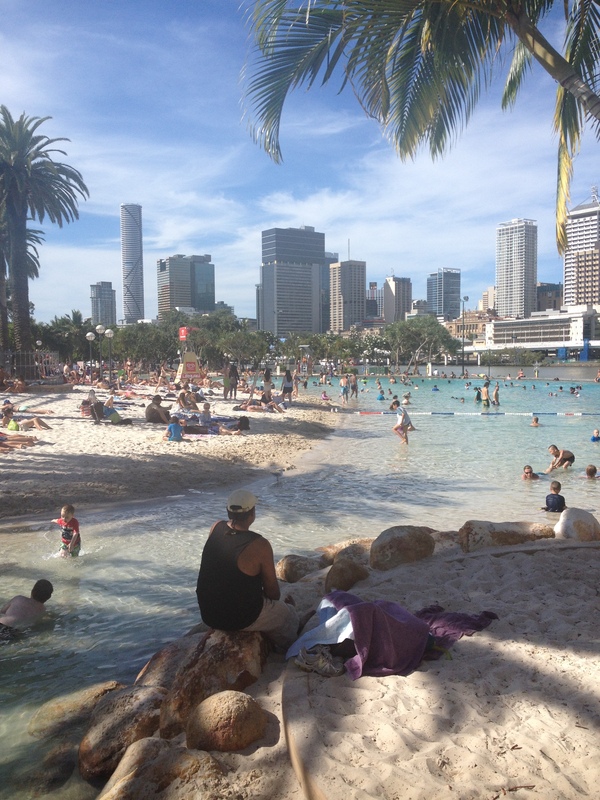 That said, I quite like Brisbane.